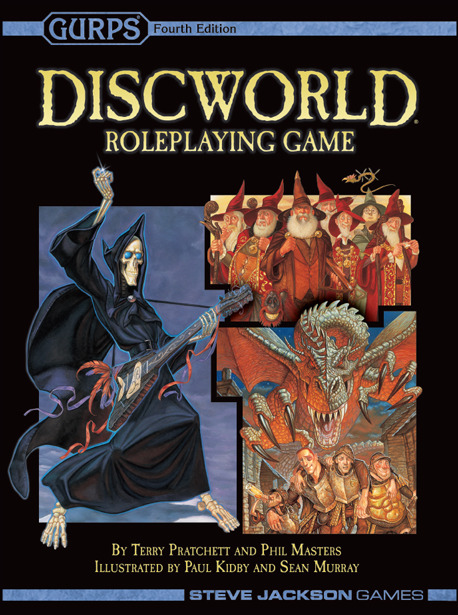 Journey through the off-kilter imagination of Sir Terry Pratchett in the Discworld Roleplaying Game. There's a lot of unusual stuff on the Disc, but don't worry about getting lost – game author Phil Masters has crafted a roadmap to Pratchett-inspired storytelling. Visit settings like the most dubious city in the multiverse, Ankh-Morpork. Intervene in the cultural interactions of trolls and dwarves (but watch out for flying axes). Campaign for goblin rights. Flee from an angry Swamp Dragon (two feet of mindless fury and high-explosive digestion). Even find out why the why the second-greatest lover on the Disc needs a stepladder. And remember, the world is round. And also flat. This is a complete roleplaying game. You need no other books to play. 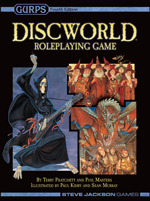 It includes the material from the previous edition of the game and its supplement, Discworld Also -- all of it updated to reflect the events of the Discworld novels released since then, as well as the rules of GURPS Fourth Edition. Download a Discworld Banner for your web site.